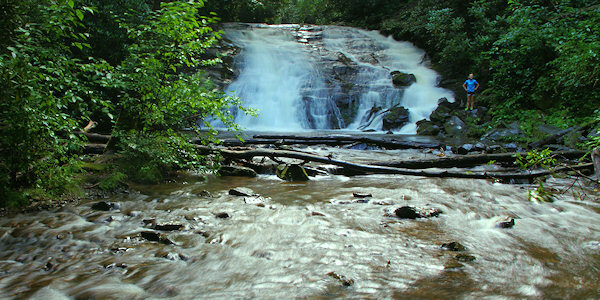 The Deep Creek area of the Great Smoky Mountains National Park is known for its streams and hiking trails to waterfalls. In addition, you can tube, mountain bike, picnic, fish and camp. 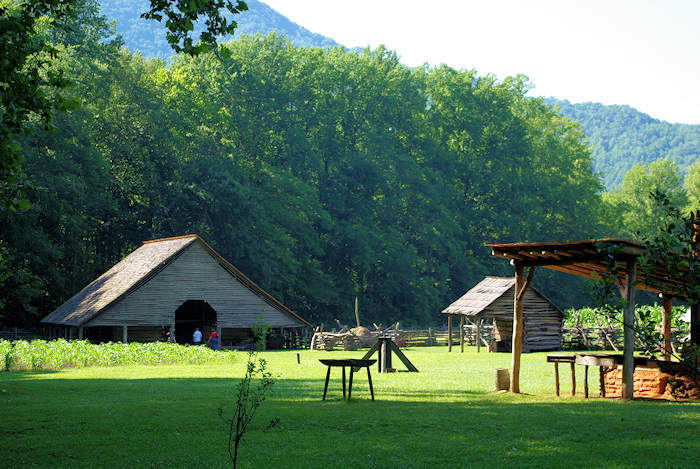 Located on the North Carolina-side of the park near Bryson City, it's about 65 miles from Asheville. Hiking: From very short trails to a see a waterfall to longer day hikes deep into the Smokies, there is hiking for everyone in this area. Trails to the waterfalls start from the large parking area at the end of Deep Creek Road (across the creek from Deep Creek Campground). You can easily extend your hike with a network of trails. 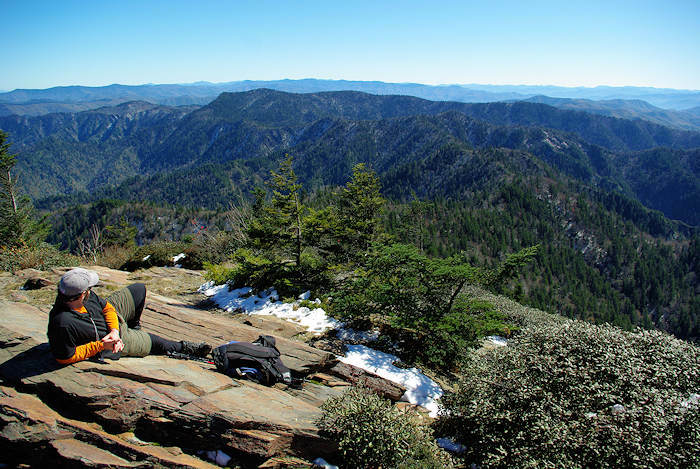 See more hiking trails in the Great Smokies. Waterfalls: Trails to each waterfall are short. 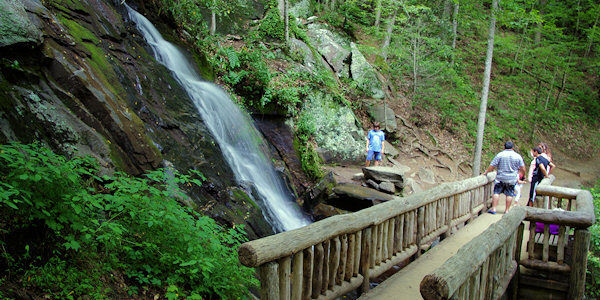 See the 90-ft. Juney Whank Falls (pic) via a steep, well-marked, 1/4-mile trail from the parking area. Also from the same parking area, take the Deep Creek Trail about 1/4 mile (easy walk) to Tom Branch Falls, another 80-ft. cascade. Continue along the Deep Creek Trail for approximately 1/3 of a mile past Tom Branch Falls to Indian Creek Falls that spills 25 ft. into a picturesque cove. The round-trip hike to see these two is 1.6 miles and easy. There are two loop trails that take you to all three: Three Waterfalls Loop (2.4 miles) and Deep Creek-Indian Creek Loop (5 miles). 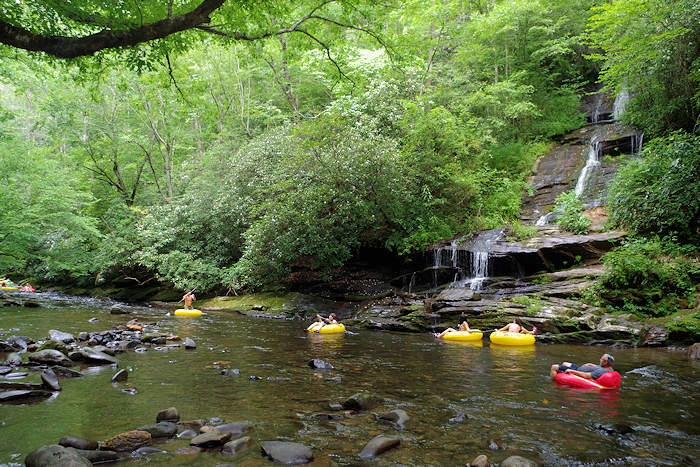 See our Deep Creek Waterfalls Guide. See map below or download a PDF Map of these hiking trails. 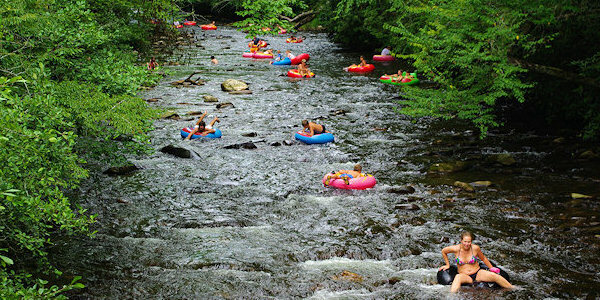 Tubing: The Deep Creek tubing run consists of two sections: The upper "whitewater" section for adults and good swimmers flows from Indian Creek through the narrow Deep Creek gorge with a wild, bouncy ride. The lower section is wider, easier-going, more appropriate for all ages and ends at the parking lot. Hike up the trail by the creek, past Tom Branch Falls to several put-in spots along the river. There are no shuttles, so you'll have to walk your tube. Find changing rooms at the big picnic area restrooms. Need a tube? There are many rental companies along Deep Creek Road as you drive from Bryson City. One is Creekside Snack Bar at 1881 West Deep Gap Road, Bryson City, at the park boundary. There is no snack bar inside the park. Go to their website for a list. Picnic: Picnic area is open year-round and has restrooms. 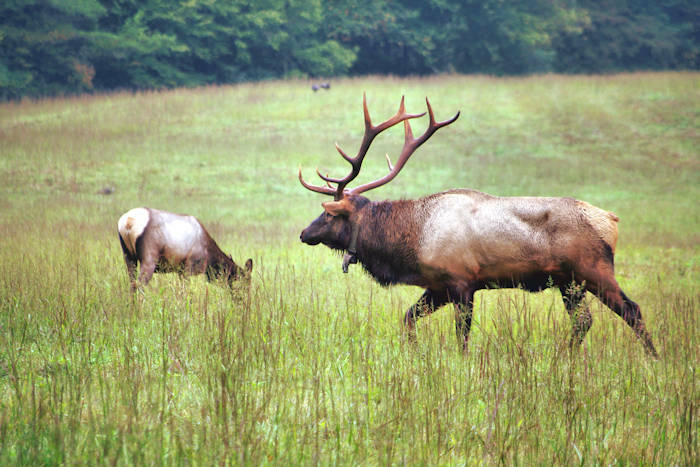 Fishing: Pick up fishing regulations at a Great Smoky Mountains visitor center. A Tennessee or North Carolina fishing license is required to fish within park boundaries. A fishing license may be purchased in Bryson City or other nearby communities or online from the states of North Carolina or Tennessee. Camping: Deep Creek National Park campground is open from early April until late October, 92 sites, $21/night. Group camping is also available. They do not take reservations. It's first come, first serve. Maximum RV length is 26 feet. No water or electric hookups. Restrooms with cold water and flush toilets. No showers. There are several designated backcountry campsites (camping by permit only) along Deep Creek Trail. Pets: As with most trails in the Great Smoky Mountains National Park, dogs are not allowed. Directions: From downtown Bryson City, take Depot Street east to Deep Creek Road (turn left). Drive 2.3 miles to the Great Smoky Mountains National Park entrance, and then another 0.5 mile to the parking area for the Deep Creek Loop hike. This is about 65 miles from downtown Asheville. From Asheville, take I-40 west to Highway 74 West/Great Smoky Mountains Expy, then exit 67 for Bryson City. Quick hike option to see three waterfalls. 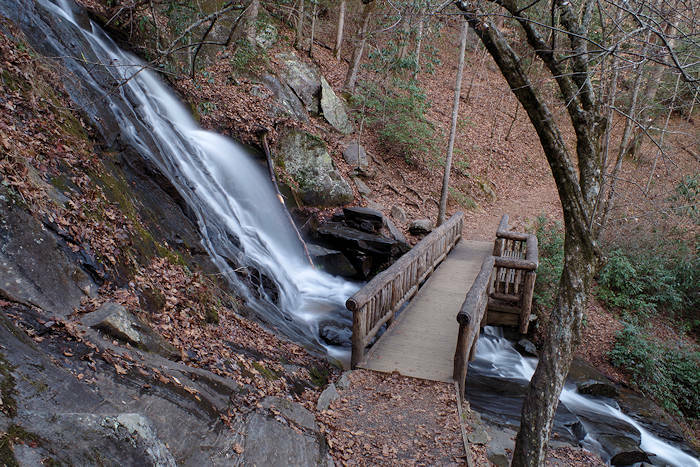 See our Deep Creek Waterfalls Guide.